We’ll be doing a smaller Civil War event here at S&FwM but what we’re most excited about is X-Men : Apocalypse. 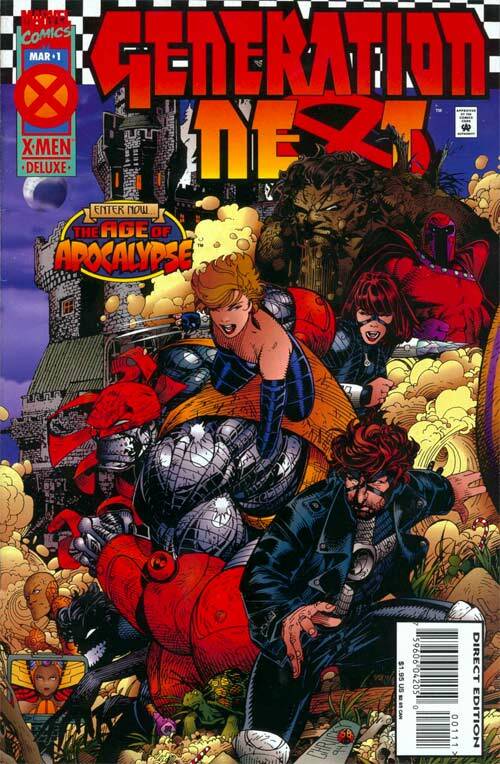 To be honest, there was a part of me that debated to do Age of Apocalypse or Apocalypse : The Twelve. Since neither one seems to be used as the basis of the film, I went with the original. I have enough comics of each to fill an event month but I figured Age of Apocalypse would be a lot more fun. I don’t own X-Men Alpha, but if I did, I would have started there. The goal is to go in chronological order, of the stories. I may get it wrong, along the way but that’s okay. This issue opens with Chamber, but with his whole face intact, jumping from an explosion. Instead of the hole where his next and jaw should be, it is in his chest. I do like how Bachalo gets first billing then Lobdell. I wonder if that’s how they are credited for Generation X.
I guess now is a good as a time to quickly explain Age of Apocalypse. Legion went back in time, trying to kill Magneto, instead, Xavier jumped in and took the kill shot. 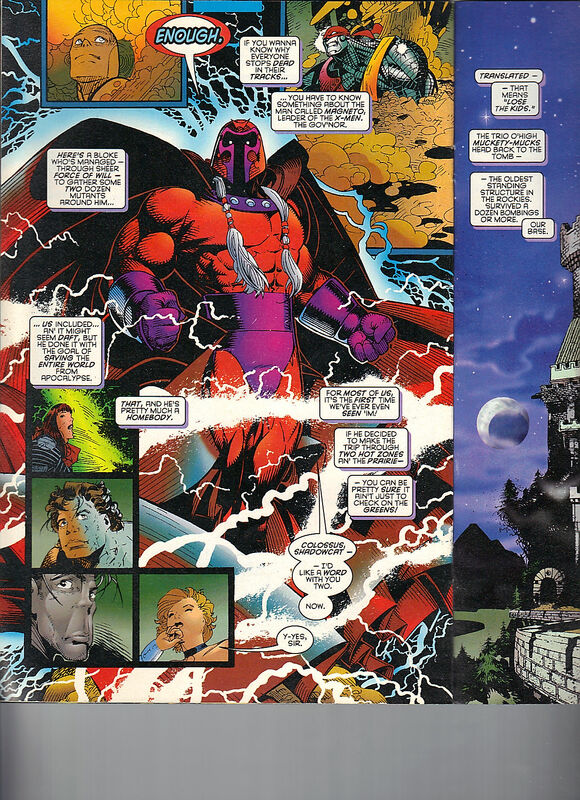 Twenty years later (or something) Magneto is now the leader of the X-Men and Apocalypse is in charge of America. There is an ad for Disney’s Gargoyles The Movie, which I’m not sure if the movie is just the pilot but I remember really enjoying that show. The ad says it is their origins so it must have been the pilot plus. We see that this was a training session with the Generation Next that follows the X-Men. Boy, is that a hard title to work into a sentence. Husk gets the drop of Chamber, I like how she is a brunette here. Skin arrives and he is gigantic and very angry. He’s tired of these two kissing while he has to risk his life. Generation Next 1 – Hoping to recruit the next generation of mutants for the crusade against Apocalypse, Magneto reveals the long hidden truth about Colossus’ lost sister, Illyana! By Scott Lobdell and Chris Bachalo! 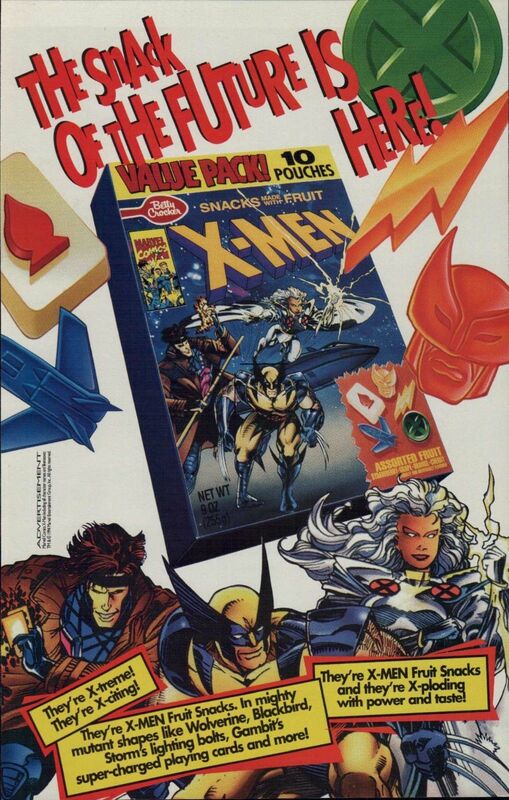 There is an ad for X-Men Fruit Snacks, the symbols are – Gambit’s playing card of Ace of Spades, Blackbird, a green X symbol, Storm’s lightning bolt and Wolverine’s head. Husk gets the upper hand on Skin and they are stopped by one of their mentors . . . Colossus! Who, while looking through all of these comics I’m going to review, and seeing which pages I will need to scan, I didn’t realize how much Colossus was involved in these issues. 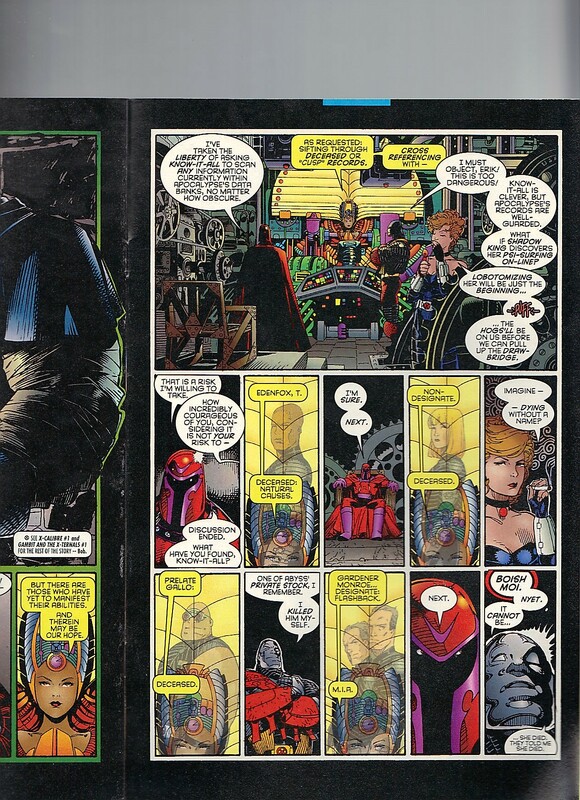 Colossus states that Chamber is the leader of this group, but he is weak and sentimental. While scolding Chamber, Husk gets the upper hand on a second dude, this time, Colossus. Before Husk can further prove how much of a bad arse that she is, the true leader of this group, Shadowcat arrives! Such a great character design! Shadowcat enjoys really slaying into Husk’s face, as she knows Husk’s face will just shred and shred – without really harming her. Shadowcat is trying to harden these children, as that’s the world they live in. Husk thinks she is being pretty clever by luring Shadowcat closer to her, to get yet another drop on someone. Shadowcat lets her make a move but Husk’s claws phases through Shadowcat’s waist. For her thanks, Shadowcat kicks Husk to the face! While Colossus is distracted, Chamber drops a tree on him. Shadowcat refuses to let up on Husk, the lesson is nowhere near over. Before Shadowcat can up the torture level, she is taking by surprise! Skin has decided to aid his teammate. Now that Shadowcat has her bearings, she tugs down on Skin’s tentacles and brings him down to where she is. Skin is gloating how he is doing a better job than expected. Husk, who doesn’t like the treatment she was given, decides to barge through Skin to get at Shadowcat. Husk is a pretty ideal student, in this timeline. I’m not sure who this lady in the television set is suppose to be, but she calls time on the session. Colossus starts freaking out, that Shadowcat could be hurting. Magneto arrives, and he just loves taking time out of his busy day to make sure the kids are doing okay. I like the comment about how he doesn’t get out much. I wouldn’t either, if I was married to Rogue and we were raising our son, Charles. Magneto wants to have a meeting with Shadowcat and Colossus. Generation Next’s home is in a castle. Mangeto isn’t thrilled with how the children are being trained. Colossus doesn’t appreciate Magneto’s tone that he used in front of the students. 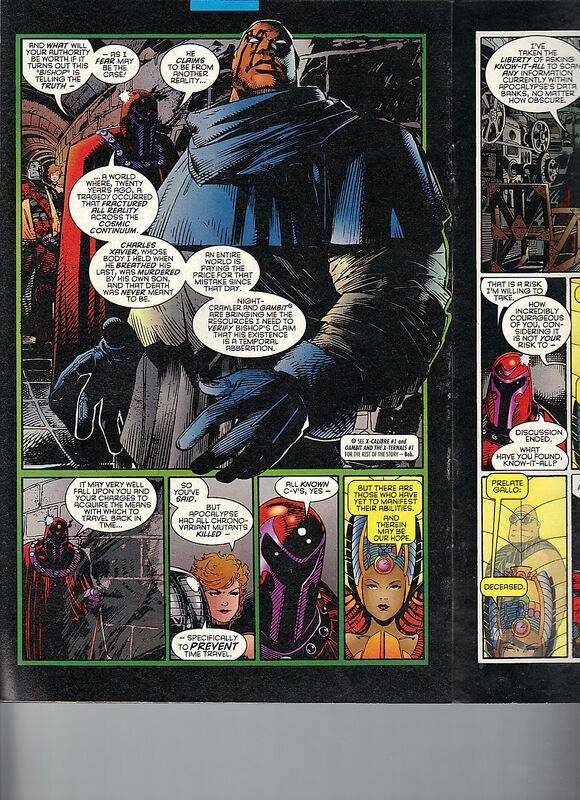 We are introduced to Bishop, who is from the Proper Marvel Universe, but his memory isn’t fully there. Magneto does a good job of promoting X-Calibre 1 & Gambit and the X-Ternals 1, as Kurt and Remy are bringing proof of Bishop’s story. Magneto wants to do some old fashion time traveling but Shadowcat knows that isn’t possible due to all of the chrono-variant mutants have been killed. Know-It-All is the lady in the pharaoh headdress and in the computer monitor. Apocalypse has Shadow King on the payroll, and their records are highly guarded. I’m not a big fan of Shadowcat smoking but when every day could be your last, why try to prolong it? Isue ends with the big reveal, a chrono-variant mutant lives! That mutant, of course, is . . .. Illyana Rasputin! Everything about this series, was like, tailored made for me. Colossus thought his kid sister was dead but she sure isn’t! The odds of rescuing her are .000% which isn’t great. 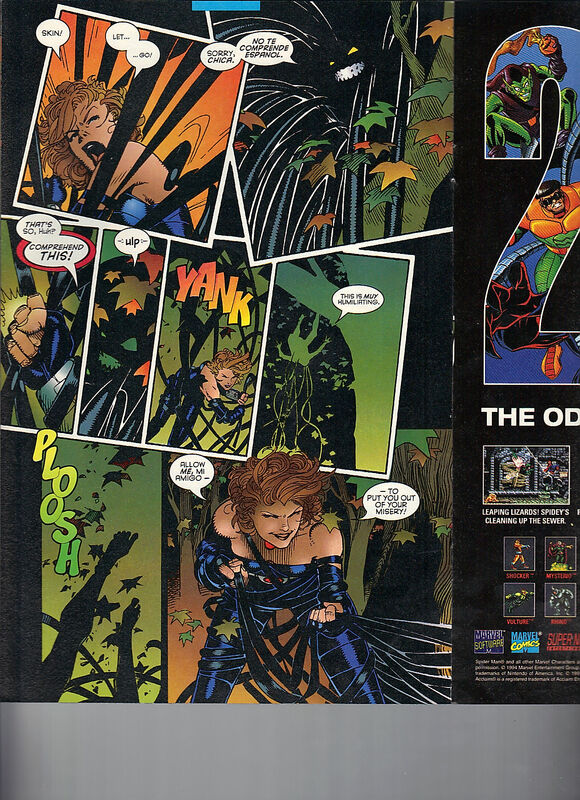 There is an ad for X-Men Captain Universe comic that you could get personalized with your name! It would only cost $14.95 plus $2.95 shipping and handling! Which I remember my mother being willing to do it but my sister would have to get one too and $30 was too much. Looking back, I guess she wasn’t okay with it.